HomeDiet & FitnessFat LossGeneralMental HealthChoose YOU! As you get older is is easy to forget about YOU. You start putting yourself last, You put everyone else before you because you think that’s what you’re supposed to do. You can’t remember when the last time you did something just for you. You feel like you’re in a funk. You start feeling bad about yourself because you compare other people highlight reels to your life. You realise that not putting yourself first is not serving you and your are not showing your family the funny, caring, exciting person you are. However there comes a time when you realise that life is slipping away. You know that if you don’t change things and put yourself first for once you life will only get worse. The good news is that after every BREAKDOWN. 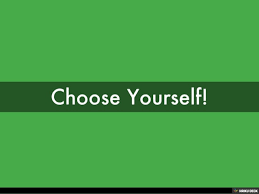 You know all you have to do is CHOOSE YOU!!! Just like in the Wizard of OZ. Dorothy had the power to go home all along. Not Just for your Family, your kids and your partner….